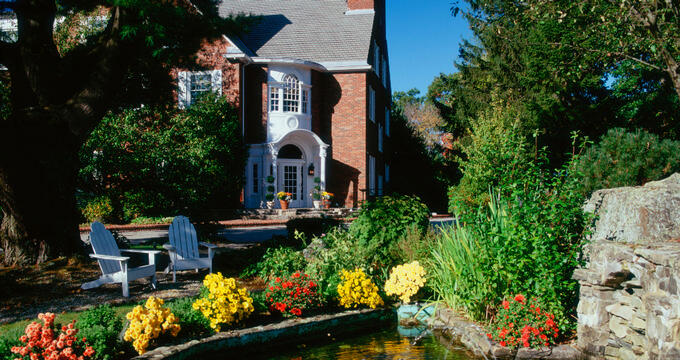 The inn is located just an hour outside of Hartford, CT, in the historic town of Norwich. It sits on 42 gorgeous acres full of outdoor activity areas, and even a fully-functioning apiary. Visitors find their stay at the Spa at Norwich Inn to be luxurious, but with the comfort of home. The inn has 100 guest rooms of all shapes and sizes. There are different themes to each, but every room has modern amenities with high-speed Wi-Fi, specialty bath products straight from the resident spa, and a television with cable, movie channels, and pay-per-view options. Country Room with a King Bed – The Country Room with a King Bed can accommodate up to four guests. It includes a king-sized bed in an open bedroom, as well as a living area with a sleeper sofa. The room also offers two flat-screen televisions. Country Room with a Queen Bed – The Country Room with a Queen Bed can also accommodate up to four guests. It includes a queen-sized bed in an open bedroom, as well as a living area with a sleeper sofa. The room also offers two flat-screen televisions. Standard Room with a King Bed – This room has a large bed with the basic amenities that come with every room and a spacious seating area. Standard Room with Two Double Beds – This style of room has all the basic amenities and two double beds. Standard Room with a Queen Bed – This room has one queen-sized bed and can accommodate two guests. It consists of a flat screen television and a seating area. The Canterbury Suite – This suite offers visitors a private bedroom, a dining area, and an ample living space. The living space includes a king-sized bed and a sleeper sofa for additional guests. This room can accommodate up to four guests. The Garden Suite – Four guests can comfortably stay in this type of suite. It includes a bedroom with a king-sized bed, a separate living area with a sleeper sofa, and a dining area. There are also two full bathrooms. The Terrace Suite – This lovely suite can accommodate four guests. It includes a bedroom with a king-sized bed, a separate living area with a sleeper sofa, and a dining area. The bath offers an oversized Jacuzzi tub. Views of the grounds are available from the attached deck. The Windsor Suite – This large and luxurious suite has two rooms and can accommodate up to eight guests if an adjoining room is booked. This suite includes a large dining room table, a bar, and a large Jacuzzi tub. The suite itself contains a king-sized bed and a sleeper sofa, while the option adjoining room includes two double beds. Villa Duplex – These rooms are a two-floor facility with a loft. The duplex includes two queen-sized beds, two full bathrooms, a kitchenette, and a living room. It is also equipped with a fireplace. Villa Studios – These include a kitchenette, a balcony, and a fireplace. Guests can book either a king-sized bed or two double beds in these villas. The Spa at Norwich Inn also offers ADA-accessible rooms. The Spa at Norwich Inn features a slew of dining options for guests to enjoy during their stay. As the resort’s signature restaurant, Kensington’s at Norwich Inn is open for breakfast, lunch, and dinner. The restaurant features an expansive selection of beverages and dishes, as well as a brunch option on Sundays. Kensington’s also provides a Hauser Chocolatier Truffle Menu. Ascot’s Pub offers hearty pub fare with a unique flair. Guests can enjoy appetizers, burgers, and chocolate truffles alongside an expansive drink menu. Ascot’s Pub also hosts specialty drink events and live music. Situated near the Spa, the Juice Bar features healthy snacks, wraps, and freshly blended smoothies. The Terrace Deck offers views of the outdoor pool where guests can enjoy their food. For a day of rest and relaxation, guests can head to the Norwich Inn’s Spa. Visitors can order a variety of signature massages, body treatments, and facials. Nail services, hair styling, and waxing services are also available at the hotel’s salon. The Spa also offers seasonal treatments using fresh ingredients from the local area to enhance relaxation. Tarot readings and Soul Sessions, which provide spiritual guidance, are also available. Guests can find the fitness center, steam room, sauna, or the indoor pool within the spa. The fitness center offers private training and a selection of group fitness classes. The Spa at Norwich Inn’s picturesque location and facilities make it ideal for gatherings of any size. Available facilities include the Grand Ballroom, which can accommodate up to 250 guests, and the Conservatory, which offers views of the grounds. Each facility is outfitted with a variety of technological and audio-visual equipment, and catering from the chefs at The Spa at Norwich Inn is available for any event. Couples can also make their wedding-day dreams come true at The Spa at Norwich Inn. The hotel offers a range of indoor and outdoor venues that are perfect for weddings of any size and aesthetic, including the Grand Ballroom and Ballroom Patio. The resort supplies multiple wedding packages, rentable décor, culinary services, and ceremony coordination by an on-site wedding planner.